Brow bone reduction is a recognized facial reshaping procedure to reduce the prominence of the lower forehead. In doing so the reduction is in a reverse horizontal direction, moving the outer edge of the brow bones backward. 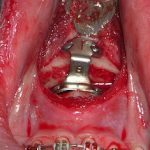 This operation mainly effects the central part of the brow bones where the frontal sinuses reside. It may or may not include reduction of the outer aspect or tail of the brow bone. In many cases it does not. Outer tail or lateral brow bone reduction is done for two specific reasons in my experience. As noted previously many typical brow bone reactions exclude the reduction of the tail. While this is not relevant in a male brow bone reduction, it is important in male to female transgender brow bone reduction to complete the feminization effect of the lower forehead. Having the outer brow bone taper more inward avoids a flat brow bone look. Thus completion of a prior transgender brow bone reduction is one reason for the procedure. The other one is in females who do not have a central brow bone protrusion but only a lateral one. The tail of the brow bone sticks out creating an unaesthetic prominence. Tail of the brow bone reduction, as an isolated procedure, is done through an upper eyelid incision. The incision is made in an upper eyelid crease. A skin-muscle flap is raised to access the brow bone area which is exposed in a subperiosteal fashion. From this exposure the horizontal projection of the brow bone can be reduced by burring. In addition, if indicated, the inferior edge of the brow bone can be reduced which raises the vertical level of the brow bone. 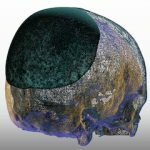 This creates a 3D reduction effect in contrast to that of the 2D changes done at the more central brow bone area. 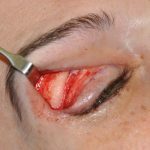 Transpalpebral Brow Bone Reduction Dr Barry Eppley Indianapolis Bone burring through a small eyelid incision must be done very carefully, guarding the delicate tissues of the eyelid.